You may remember a while ago I visited the Euro Pony sim, and was impressed with the setup there. Well, the sim has been redesigned and looks better than ever. 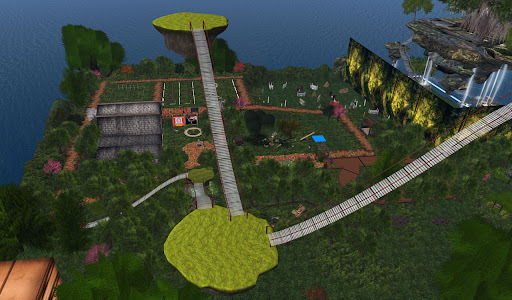 The landscaping has been made more lush and green, and the barn has been upgraded. Lots of skyways to test your pony's carting skills, and all the usual array of training equipment fill the sim, including a speed cart race track. 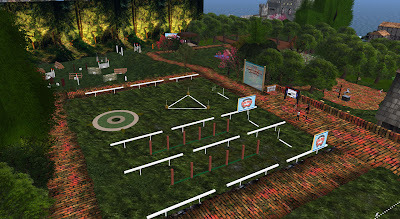 New to the sim is a puppy area, complete with a teeter board (see-saw). Best of all, the stadium is still there, though it has had a lot of the extra prims removed, presumably to reduce lag. The updated sim looks even more impressive, with a wider range of equipment to keep any pony busy. If you have not already been there, be sure to take a look, its a great looking stable, well laid out and spacious to boot.